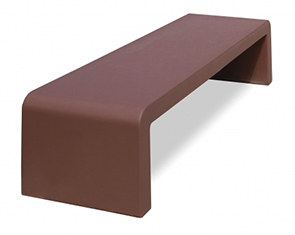 The simple elements of straight lines incorporated with it's smooth rounding edges provides a classic backless concrete park bench that delivers a very modern minimalistic aesthetic. The quality construction unified with high level of attention to the details, make certain this bench will offer an enrichment to the landscape wherever installed. Reinforced with 3/8" rebar this bench meets and exceeds the ASTM standards — this modern backless style concrete park bench can be anchored with four cast-in thread inserts. Available in the variety of color options and finish styles as shown.